Cutting cycle Ave 14 months, with view to extending it. Cut 80% of the farm annually. Heavy rain was predicted and heavy rain was delivered. Rain makes farmers happy so I knew it was a good day to spend in their company but, what about the pictures? How was I going to get anything worth publishing and come away with a functional camera? … nothing comes from finding excuses though and I had managed to line up two farm visits in one day, so I left home at 6am, as planned, and aquaplaned up the N2 towards Darnall. Boy, am I glad I did! On arrival, I slid passed Pete and Di Goss, dripping rain all the way into their warm office, while they kept the Dobermans from finding an opportunistic gap through our legs. All huffing and puffing, trying to protect anything not yet sodden, and shaking raindrops everywhere I finally looked up and into the faces of people I immediately felt connected to – I am sure the Gosses make everyone feel that way; like a special guest – they really are the most sincere and welcoming kind. 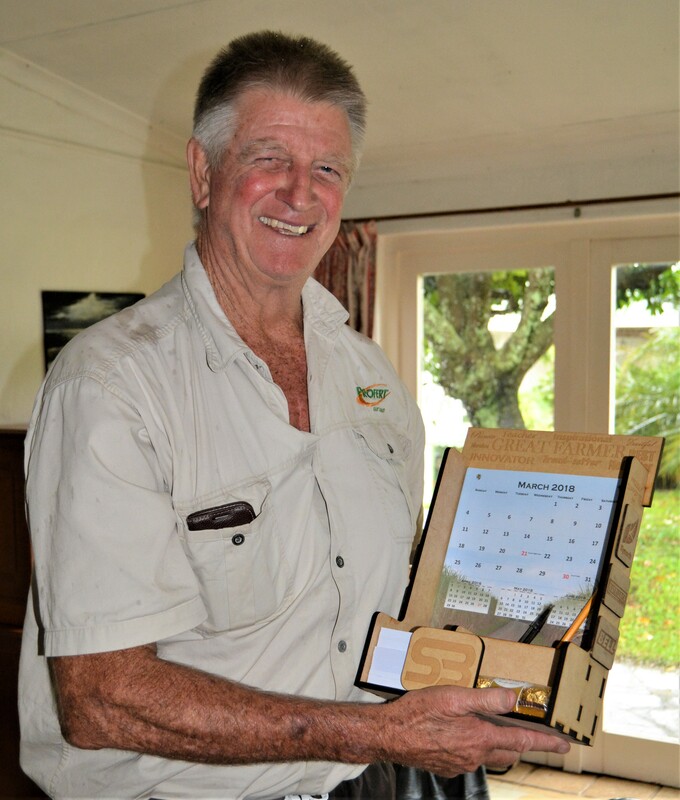 Pete was born in Mt Edgecombe, his Dad was an estate manager for Natal Estates, running a farm called La Lucia Estate. As you’ve already guessed, it is now the developed area of La Lucia. Pete completed his National Service and then went to work for Di’s dad, on Umhlatuzi Valley Sugar, (UVS), near Empangeni in 1969. But, when his own Dad passed away in 1972, he was drawn back to the Mount Edgecombe area to take up a job with the same company his Dad had worked for. This position came with housing, which enabled him to provide a home, and care, for his Mom. Pete stayed here until he was offered a promotion to Darnall with Tongaat-Hulett Sugar. Di was working at SASA Industrial Training Centre and it was incredibly difficult for her to give up her job. They were both reluctant but eventually made the move to manage the 1200 hectares owned by the group’s Pension Fund, in 1987. Thirteen settled years followed. Then, in 2000, life changed forever when their only son, Darryl, was killed in a car accident at just 23 years old. 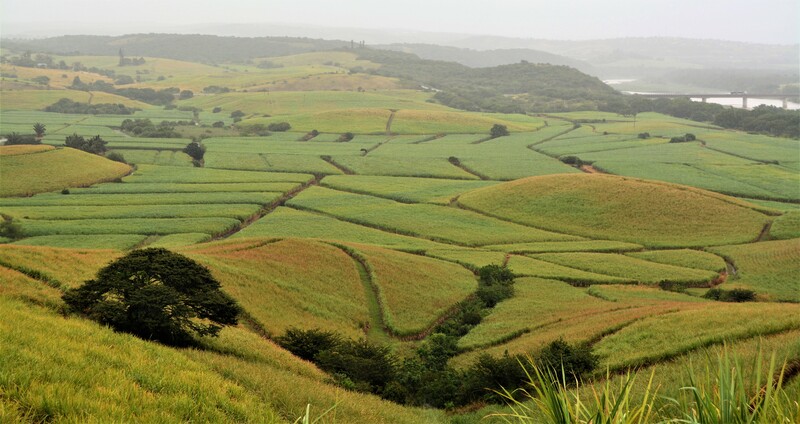 In 2002, THS were divesting from landownership and this included the Pension Fund’s portfolio of farms. Pete was facing retrenchment. A sliver of hope presented itself when Dr Shuker suggested the Gosses take the opportunity to buy some of the land up for sale. A mad scramble ensued wherein they sold sheep, cattle, residential property, their shoes … literally everything. They even went to the banks for a loan – the first time they’d EVER considered any kind of debt. As we all know, banks don’t loan money unless you can prove you don’t need it, and the Gosses needed it! Somehow, they scraped together enough to secure 200 hectares, with no homestead. Seven other farmers took up the balance of the THS land and one of the neighbours gained a house they didn’t specifically need and so it came about that Pete and Di now live in a house on land neighbouring theirs, owned by the Zunckels, who happened to be my ‘afternoon interview’. The house is named Bleak House – a rather ‘bleak’ name I thought but apparently, it’s named after a Charles Dickens novel. It also has significant historical value as it was used as an officers’ mess during the Boer War. In addition to the 200 hectares they now owned, they also took over a lease of 170 hectares that was left over from the THS offload. It was time to get some assistance on the farm and Ryan De Matteis, then a tender 19 years old, came on board to become Pete’s right hand man. Pete’s philosophy was to train and teach for 3 years and then set the youngsters off to flourish in their own right, which is exactly what Ryan did. After exploring other careers, he has settled back in this area and I am grateful to him for being the reason that Darnall farmers are now benefitting from exposure to these SugarBytes’ Top Farmer experiences. Hazel, Pete and Di’s daughter, then launched herself into farming and became wonderfully successful. She completed the SASA sugar cane courses, with a merit pass, and was well-equipped to take the operation to a new level. But, distracted by love, she married and became a mom instead. 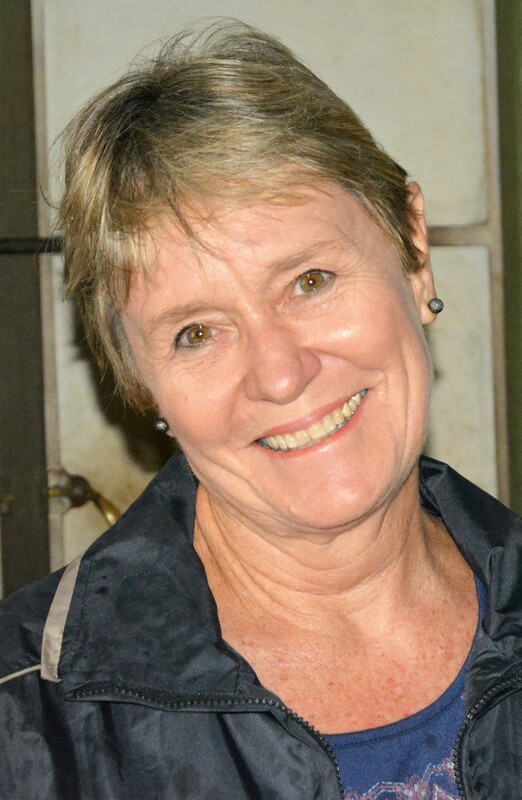 She now runs her own flourishing accounting practice from home. Craig Coleman, Hazel’s husband, was working across the river and Pete watched him get some solid practical experience before he invited him to take over from where Hazel left off. Craig has been working alongside Pete for 3 years now and they make a great team. When I asked about staff structures and prompted Pete by beginning with him and Craig as top management, he looked at me, horrified that I would make such a blatant error; “It’s Di at the top … then Craig, myself and everyone else!” Deep, hearty laughter filled the room as he looked across at his beloved wife, and boss. Cane supply agreements seem to be set on the basis of “forever” here in Darnall. It isn’t something I have specifically focused on before but I am sure that 50 years is a lot longer than what I have previously encountered. This is one of the reasons that Pete hasn’t pursued other crops. 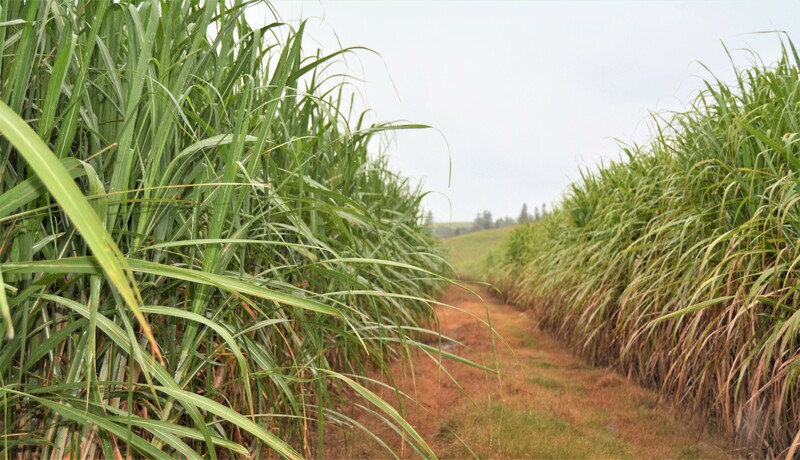 “That’ll be Craig’s decision to make in due time.” They recently bought another cane farm (110 hectares) 5kms away and that cane supply agreement is shorter term, allowing for future flexibility. 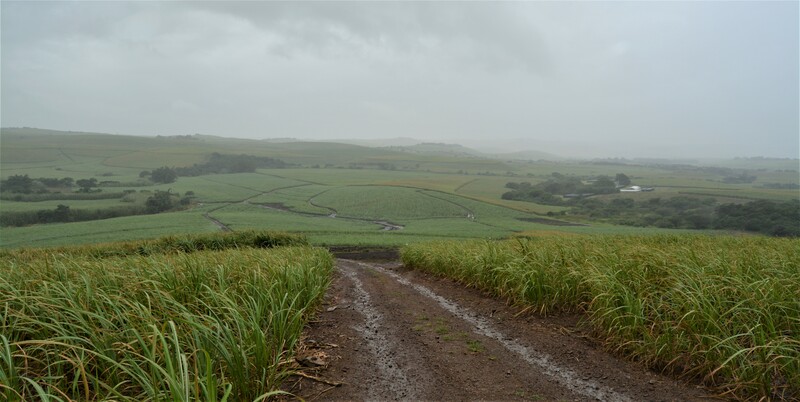 For now though, this farm requires intensive rehabilitation and, when up to speed, it will add to the volumes required to make sugar cane farming viable. Pete doesn’t allocate fallow field time to his programme, and for this, he says he sometimes gets ‘looks’ from the youngsters but he feels that he puts back what he takes out through fertilising according to the SASRI recommendations after sampling both shallow and deep layers. 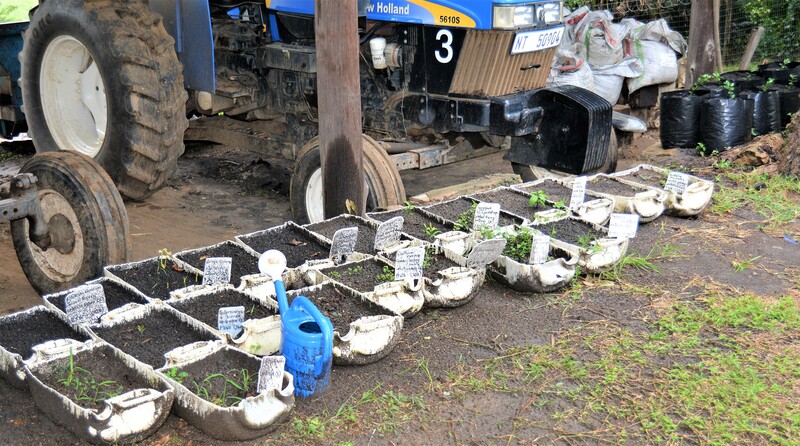 He follows the guideline of replanting 10% of the farm every year, focusing on the underperforming fields. Underperformance is based on yield. I couldn’t help but wonder what if there are no underperforming fields? Pete says there are always fields that are not keeping up with expectations, or could do better but sometimes, it is a difficult thing to do because a field might not fully warrant being ploughed out. The challenge is to stay in the programme though, “If you get out of kilter, by not replanting, and end up in a position where suddenly there is 15%, or more, that has to be replanted, it can place the business under unwarranted strain.”So, Pete advises that, as long as rainfall is good and the operation is running smoothly, try and stick to the principle of replanting 10% of your cane lands. During drought, or some other unexpected set-back (like cash flow challenges) – those are the years you can consider not replanting all 10%. So, once the old cane has been killed, Pete rips, ploughs and harrows to get the tilth right. Then he ridges and plants by hand. The seed cane is chopped up in the furrow. Premixed ferti (NPK), supplied by Kynoch, is placed into the furrow by hand, in the quantities recommended by SASRI’s soil sampling feedback. Pete prefers to watch the weather and fertilise timeously rather than change to an LAN-based product, which is far more expensive. A fungicide is then sprayed onto the sets if there is no rain expected in the foreseeable future. Pete says this gives the cane ‘legs’ and when he saw my blank stare covering a brain going a million miles an hour he graciously explained that it extends the seedcane’s germination window. Got it. He then closes the furrow. As soon as the first flush of weeds dare to push through to sunlight, out come the long-term herbicides. At the moment Pete is using a mix of Lava (4 lt), Falcon Gold (2 lt) and Gramoxone(1 lt) per hectare. When it comes to fertilising the ratoon crops, Pete does not do soil samples. He gives the Kynoch reps a list of all fields to be harvested, and the history of each, from date planted. This data states kgs of fert in furrow at the time of planting, blend, kgs of top dressing, age and yield of first cutting, and the age, yield and fert applied to each consecutive ratoon. The rep then supplies Pete and Craig with their recommendations for that year. Continuing with herbicides, ratoon cane gets Merlin (225 gm), Falcon Gold (2 lt ) and Gramoxone (0.5 lt) per Ha . He warns that any enthusiastic cane that chooses to emerge with the weeds goes off colour for a day or two but always recovers quickly and is helped along by a top dressing of fertiliser – as recommended by the Kynoch rep.
About 8 to 10 weeks later, a short-term herbicide cocktail , Galago (1 lt), Triclon (1 lt), and Summit Super (0.5 lt) per Ha is applied and that will take the ratoons through to canopy. A light weed of about 4 units/ha might be necessary. 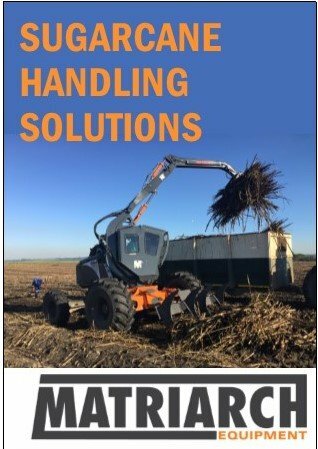 All plant cane fertiliser and herbicides are applied by hand so that the delicate new shots and roots are preserved as much as possible. But, in ratoon cane, these chores are done by tractor. Pete believes that, when ratooning, the cane is more robust and can manage the in-field traffic better, although it is still a concern and kept to an absolute minimum. Nine lines are sprayed with a single pass of the tractor, and the same when fertilizing. 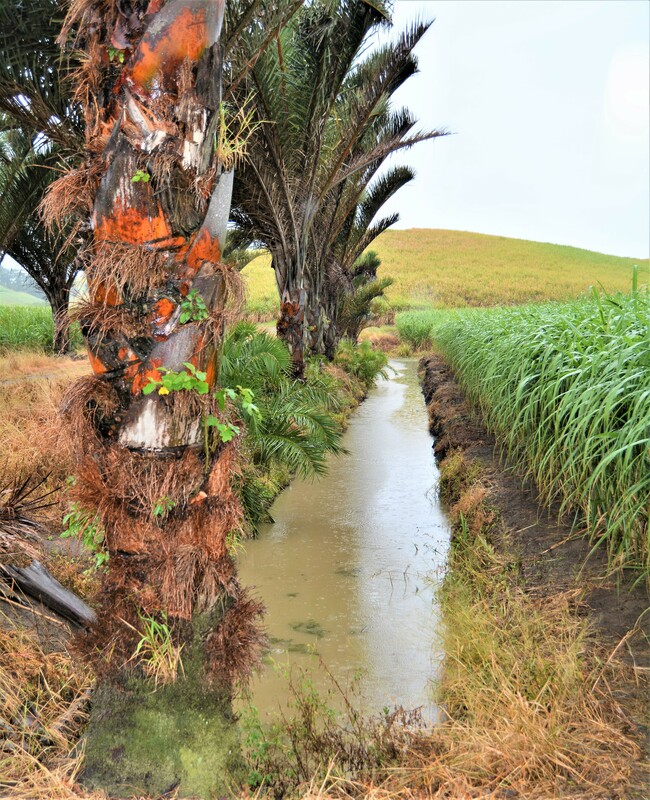 Over the next 3 years, the whole ‘new farm’ of 110 hectares will be replanted as it suffered severe neglect in the past 6 years, under the previous ownership. Bar a few shale areas, the soils are good and we look forward to seeing this farm develop handsomely. When considering your options, remember to pay attention to aspects (of the hills) and soil types. Varieties will always change. NCO376 was popular for decades, then suddenly became susceptible to RSD – now it’s degazetted. A similar thing happened to NCO310 which used to perform so well, even up to 25 ratoons. But, the environment changes, and so will the successful varieties. “It’s up to us to keep up,” smiles Pete. Pete can be proud of his yield: 75 tonnes/hectare. Definitely worth listening to a farmer who can boast this average, under rain fed conditions. Pete doesn’t trash but believes that the cold morning burns, strike the right balance between leaving enough organic matter for the soil and clearing away the unmanageable trash in preparation for cutting. In his opinion, the benefits of high cutter productivity and smaller workforce outweigh the advantages of trashing. Once the cane is top and base cut, it is laid flat, combining six rows into one – three from one side and three from the other. Then the Bell loader collects it up and places it directly into the transport contractor’s trailer. Double handling is eliminated by running a shuttle system with the haulier, who brings an empty set of two trailers. These are split on the zone and Pete’s tractor takes one trailer at a time into the field. It is easier to follow the Bell, rather than the Bell “walking” the cane to the less maneuverable double trailer, which causes most of the compaction. Once both trailers have been filled, they are reconnected on zone and the haulier takes them off to the mill. In the meantime, they have left another set of trailers which will be full by the time the haulier returns from the 10km trip to Darnall mill. Efficiencies are maximised and about a R25 to R30 per ton saving, plus probable RV increases, are achieved in this way. Also worth taking note of are the stringent hygiene standards; cane knives are dipped in Jeyes fluid and brushed 4 times a day. 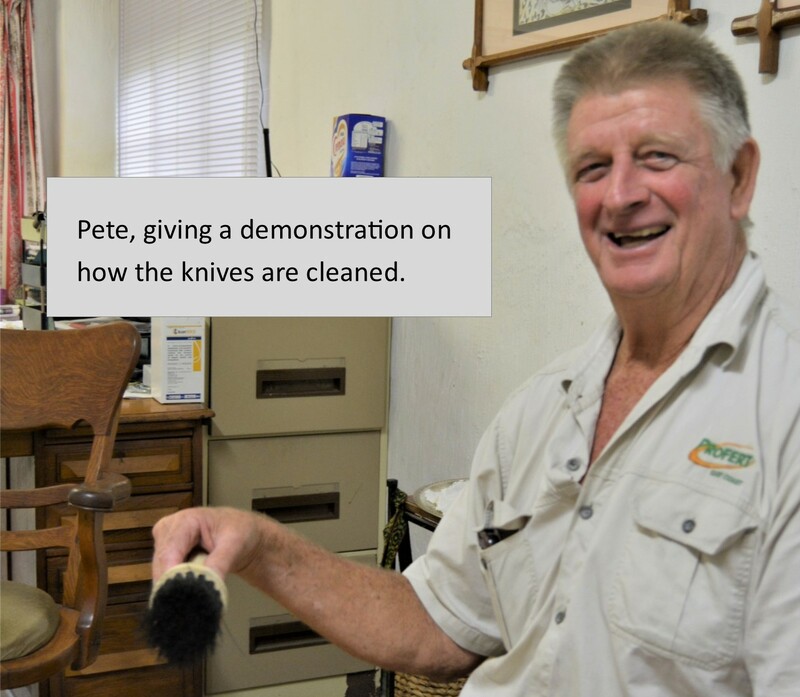 The man tasked with measuring the cut cane, and providing water for the cutters also ensures that all knives are kept clean. RSD can be very easily spread, and Pete avoids it at all costs. As a rule, Pete does not lime, unless it is recommended by the Experiment Station. His samples almost always come back stating that his acid stats are “Not a limiting factor”. Nevertheless, he keeps an eye out for comparisons and has NOT found that his yields are falling behind his fellow farmers, some of whom lime regularly. 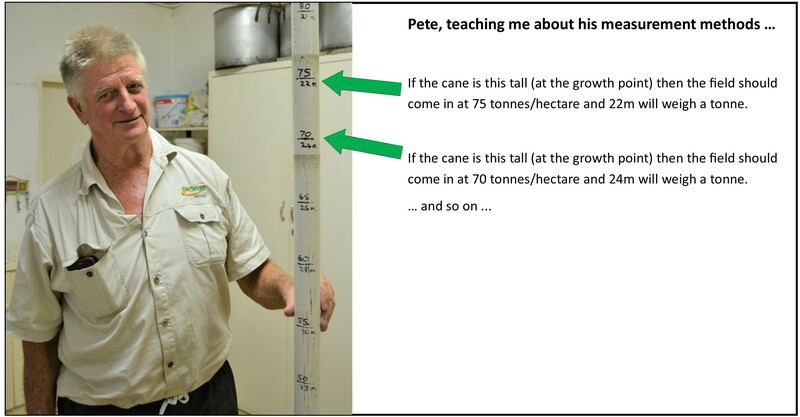 Pete ripens his fields, except carry over cane which, at 16 / 18 months old should already be sucrose-rich. He carries the cost of this, as there are no mill subsidies for this process here. Hand and aerial applications of Fusilade intensify his sucrose levels enough to warrant the expense. His average RV sits at 12,5%. Jeff Bleskovsky and Kelly Smith from Farmers Agricare, Pete’s trusted herbicide suppliers, give advice on what needs to be applied, and when. Pete relies on their input when making decisions in this area. Eldana is a challenge and Pete has been forced to use chemicals to combat the nasty beasts, when cane is carried over. Last year that meant that 60 hectares was sprayed 4 times. 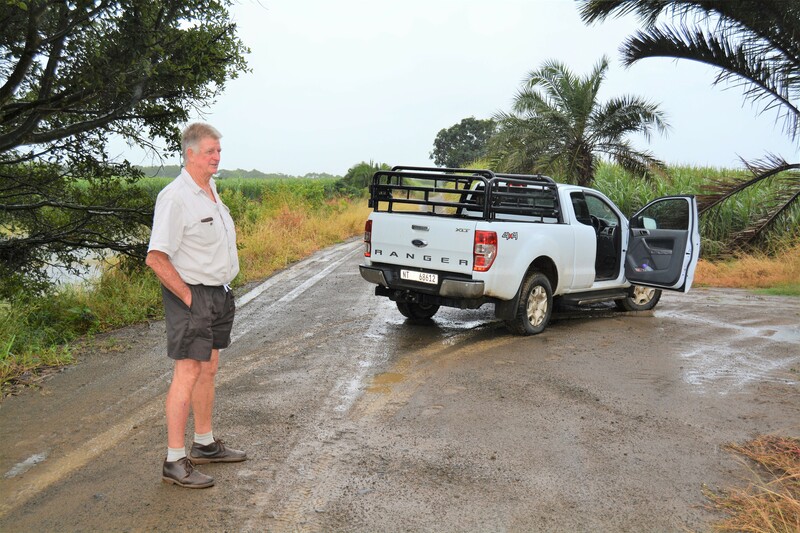 He laments that these chemicals are ridiculously expensive but Tongaat Hulett does subsidise a portion of this cost at the end of the season if all the right paperwork is provided and inspections conducted. Currently he is using Ampligo, Stewart and Coragen. Pete believes that the use of non-selective pesticides to fight infestations have killed whatever natural predators existed and left us with more problems. He therefore favours selective chemicals that target the specific pest causing a problem, even though these selective pesticides are more expensive. Brown Rust and Thrips are other adversaries on this farm. Pete advises that all pests are dealt with as soon as they are spotted. He currently uses Allice, Silhouette, Bandit, and Amistar to combat these enemies. Play open cards. Discuss all issues with complete transparency, as soon as they arise. Pete is fairly fluent in Xhosa and convenes the staff whenever there is something important to discuss. Be firm and strict. Pete has never found the need to shout and finds it extremely counterproductive. If expectations and consequences are clear, contraventions can be handled like adults. At the beginning of a season, everyone undergoes an induction process whereby they learn that, within the compound boundaries, all issues are handled by the compound supervisor. The minute they leave the gates, staff then report to the Induna or driver with whom they are working. Empower Indunas. Pete and Craig do not deal directly with the labour but respect the structure they set up and channel all communication through the Indunas and drivers. This concept is even extended to introducing new initiatives, especially if they are good ideas, it is always pitched to the labour as a brain-child of the Indunas. One team, one goal. Pete believes that ‘us and them’ will never achieve as much as ‘us together’. United focus on a common goal wins every time. The staff turnover on Thamsanqa is very low, giving credibility to the strategy Pete has chosen to implement. He wonders how many other farms can brag a 100% attendance at work, on the Monday following the “pay weekend”! This system requires trust from the labour because they do not see the weight on a scale dial. Mistakes do happen on rare occasions, but, if they are to the labour’s detriment (ie: mill says the yield was higher than what the wheel and yard stick says) then Pete goes back and pays them the difference. Average daily production is about 7,5 tonnes per cutter and the operation runs with an average of 20 to 25 cutters per day for the season. Di does all the accounts, tax and book work to trial balance, leaving daily record-keeping to the farming men. Craig spends most of his day in the fields, and a few hours in the office, analysing the day’s production data so that he can pick up anomalies to address the next day. ie: too much fertiliser, too little herbicide etc. Di’s advice in running administration effectively is simple: Stay up to date. Check everything. Pay accounts on time. Pay your taxes. You have to love her direct approach – it’s easy to see why Pete acknowledges her as the real CEO of this outfit. Di also runs a shop on the property. Initially it was started to supplement income but now it is solely for staff convenience. 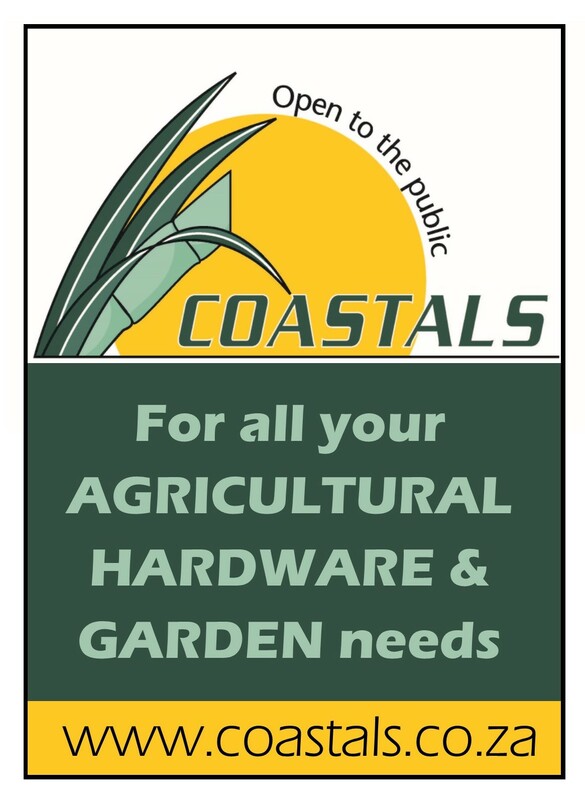 In fact, even staff from other farms support the outlet which saves them a two-hour walk to the closest taxi-stop, a treacherous and expensive ride to Stanger, higher product prices and the trip home, now fully laden with supplies. The value is simply immeasurable and no one is more grateful than Pete that Di continues to operate this outlet that saves his staff time, money and sanity every day. Quite a pun – Pete was planning to have wrapped up his farming career around about now. However, the newly acquired farm changed those plans for him. Hopefully, by 70 (he’s 68 now), he’ll manage to retire and Craig will take over. Like a real pearl, I am sure that all those years have layered on the value, so what else can he share? Listen to people. Talk to other farmers; they will tell you so much. Every conversation is valuable. Craig has started attending a monthly study group – he advises that if this is available in your area, take advantage. Pete attends his own ‘study group’ every Wednesday evening, after clay pigeon shooting, when local farmers meet to compete and share their experiences and advice. Pete establishes and stocks corridors for the wildlife by planting indigenous trees, which he grows from seedlings. 50 hectares of Thamsanqa farm’s best producing fields are very low lying, flat land. In fact, they are slightly lower than the Tugela river. 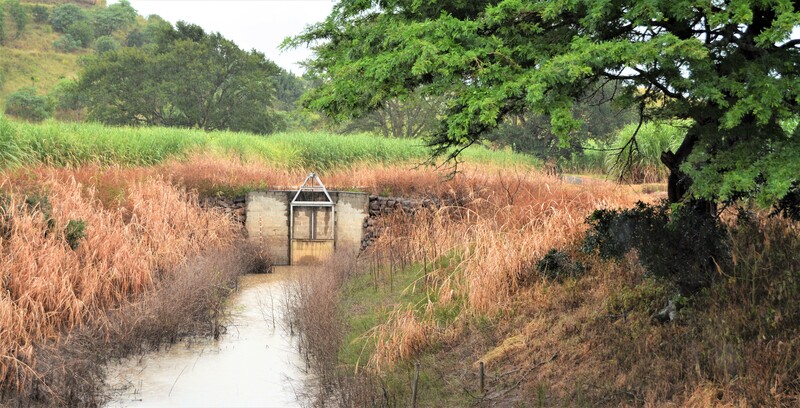 This sluice gate keeps the Tugela out of the flood plain. Sometimes it becomes necessary to pump water out of the fields – this is used to irrigate the surrounding hills. Pete has established that N36 likes wet feet and plants this variety in these low-lying fields. Now the Eldana challenge becomes more understandable as their natural fodder is wetland reeds. Some of this flood plain has been restored to the wetland and Pete even built perches which can be seen above. Birders visit from far and wide to enjoy the prolific feathered residents which include Fish eagles, Crowned eagles and Palm nut vultures. Here are the canals that hold water in the low-lying fields. From here it is pumped out onto the surrounding hills. From this vantage point (Fort Williamson during the Boer War) you can see most of the flood plain as well as the Tugela River and the N2 crossing it. 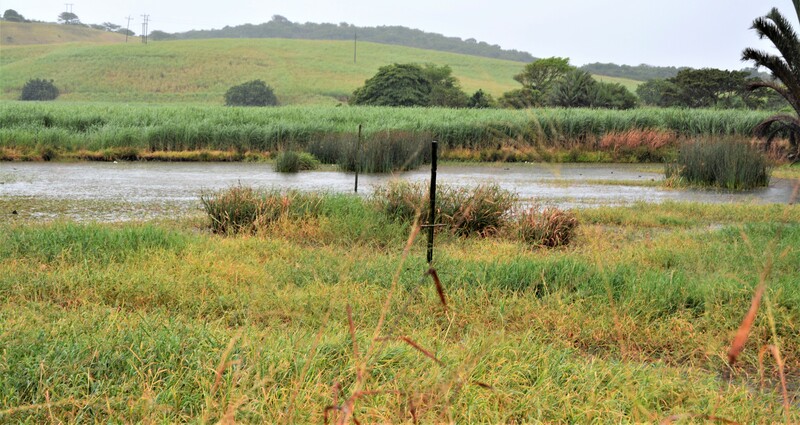 Below are some pics of the rain falling heavily and, just beyond that, you might make out the new farm, currently undergoing extensive replanting. As you can see, the soil is nice and dark, Craig says they will further supplement with filter press before planting. And finally, the rain and clock forced a retreat. I had to row down the road to meet the Zunckel family, and Pete had already swum out to his MGB meeting. The farm workers had submitted to the downpour and hung up their tools. All was happy alongside the swelling Tugela river. But it wasn’t easy leaving the Goss family – ridiculous after spending 4 hours with them but true nonetheless. They, like all SugarBytes farmers, selflessly share their lives and livelihoods with me, with no compensation. Thank you, Pete, Di and Craig, – you are magnificent indeed.